We are all aware of the cost of health care and prescription drugs. The loss of a job or your life's savings can have a significant effect on your health in many ways. The biggest problem with medical care today is that the whole industry has been made political. As a result, in order to get good care these days, we must be truly informed and understand more about the socialistic chaos taking place within the complex bureaucratic health care system. What if you have a high deductible plan and you need labs for you or a member of your family? A complete blood work up could cost anywhere from $1600 to $2500 (or more!) within an established medical network (like your doctor's medical practice with lab facilities). You can either pay that amount and reduce your deductible by that amount or you can contact a private medical lab and save hundreds. There are several confidential laboratory testing labs available. One I have used is Life Extension Blood Testing. Another is Private MD Labs. Both provide confidential laboratory testing and personal medical information direct to the public. There is no need for a physician order or referral. You just request the test or tests you need and pay directly. They send you a lab work request with a doctor's signature which you take to a local blood drawing facility (like LabCorp or Quest Labs). The results of your tests will be sent to you either by email (as a link to their online results page) or by mail. You will receive faster service and, the best part, it will cost you significantly less — between $25 - $600. Take your results to your doctor for evaluation, or Life Extension has a toll-free number to call and talk to a lab expert who can explain your results. Either way, be sure and tell your doctor how much you saved. There is now available online an "eBay-type" medical care. Sound strange? It does, but Medibid.com is becoming a way to save sometimes thousands of dollars on non-emergency surgeries, such as orthopedic procedures. What if you needed a hip replacement and locally it might cost you $70,000? And what if you could get a bid for that same surgery and it costs only $20,000? Wouldn't you check it out? You may have travel expenses if the particular doctor is located in another city. And you must pay cash in full, up front. But if you have insurance, don't you think your insurance company rather save $50,000, even if the provider is out-of-network? You bet they would. For the insurance company, it is all about the money. For you, you get to choose a doctor or facility you are comfortable with, see their training, education and experience, on the site and contact with them before surgery. Many doctors and hospitals will discount for cash-paying customers so it pays to shop around when you need a procedure that is not urgent. If you are not insured or have a very high deductible, you could save thousands by negotiating a cash payment. When my son and his wife were expecting their first child, they were uninsured due to a job layoff. So they saved as much money as they could, including borrowing some from family, and calling in a debt owed to them by a friend. When their child was born, after a normal, uneventful birth, my son talked to the financial department at the hospital and negotiated a cash-price discount of about 2/3 off the normal charges. It usually pays to talk to the appropriate financial people at hospitals and doctors' offices to at least try to negotiate a better price. Don't forget to talk to all types of doctors who might be involved — your surgeon, anesthesiologist, pathologist, radiologist, pharmacist, or any others. There are new companies that will negotiate hospital bills for you (since they are impossible to decipher). HealthCareBlueBook.com is a new online service that can help you determine what the fair prices of medical procedures are in your area, as well as negotiate prices for you. There are probably others — just Google them. Don't forget to wash hands often. Discuss with your doctor how your habits may be impacting your health and the amount of prescription medications you need to take. Check with your health plan for programs to help you take the steps to a healthier life. Be sure to visit your insurance company's web site and browse through the tools it offers. Ask your doctor or pharmacist if there's a generic alternative for any prescription drug you are taking. Check to be sure the prescription drugs you are taking are part of your health plan's preferred medication list (also called a formulary). There are often many medications available that treat the same condition. Ask your doctor for the least expensive prescription, not just his favorite. Check with your state, county, or city government for free health clinics. There may also be low-cost health care made available through charities. Our local hospitals provide free or low-cost testing from time to time. Check in your area and take advantage of these clinics. Life Happens. I was unlucky enough to be unemployed, and uninsured while needing blood pressure and cholesterol medications. My wife has Multiple Sclerosis, she also lost her main coverage when I became unemployed, although she has Medicare. 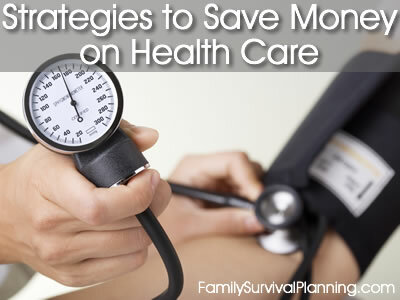 Save Money by not getting Sick in the first place. No Pills, No bills. Prevention is better than cure. Live healthy and enjoy life more by eating and drinking pure, live, nutrients. Our bodies are designed to repair themselves, and given the right materials, this is what happens.